When John McCain announced Sarah Palin as his VP pick, many, many people thought that this was one of the smartest moves the McCain campaign could possibly have made. The energy, the vigor, the family values, the evangelical roots. 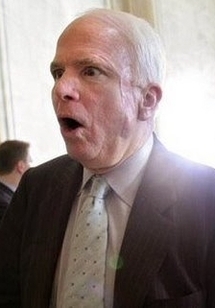 I wonder if John McCain is second-guessing the decision. Palin bombed some media interviews, notably the series with Katie Couric. And I'm sorry--but some of those questions that "stumped" Palin were pretty darn easy questions. But even if we set aside her shortcomings with the gosh-darn, "kinda" mainstream media, there are some really disturbing things going on in the Republican camp. If you haven't seen Palin's recent rallies lately, you might be a bit confused. You might ask yourself, "Is this a political campaign rally, or are we at a white-power rally?" Sure, that's exaggerating a bit, but at the same time, not really. Palin rallies have now become as close to angry mobs as you can get, where Palin continues to harp on misconstrued facts and personal attacks and riles up the emotions of her audiences. But isn't that what all politicians are doing, you ask? No, no it's not, actually. And coming from Palin, at whose feet many evangelicals are falling down, her ethics and integrity are extremely disappointing to me. Here's a link to some videos and the comments made at recent rallies. You might say, "Palin can't control what other people say." I say, to a degree, yes, she can. She controls the tempo, the mood, the atmosphere. If she wants it to be a positive, encouraging campaign rally, she can make that happen. And if people still are screaming inappropriate things, she has the ability to make it clear to that person, to the crowd, and to the country that that kind of behavior is out-of-this-world unacceptable. She has the power to say, "No, that's not right, it's not fair, and frankly it's pretty hateful. I am not about that kind of attitude and neither is this campaign." Rather, she embraces the angry mob atmosphere, probably because it fits her low-brow style of attacks anyway. McCain is still up in the air for me. So is Obama. But I've had it with Sarah Palin, and I can't even pretend to not have my blood boil when I see her, not just because of just how uninformed she is and what she is allowing and enabling as far as low-down mudslinging and race, but mostly for the crap image that us Christians are getting because of someone in the limelight (again...story of our lives). The most intriguing part of the video (that plays automatically) from that link is the guy's use of the phrase, "Palin Land." How things go very, very well for Palin inside her bubble, a "hermetically sealed environment" but she has much less relevance and respect outside of the walls of Palin Land. Does anyone else see a little parallel with the bubble of Palin Land and the bubble of Christian churches? Or the "coincidence" that many of the dwellers of Palin Land and Church Land are, in fact, one and the same?